T. Austin-Sparks wrote: “We should feel like people who have come to the doors of a new realm full of wonders – unknown, unexplored, unexploited.” All the coming wonders of God reside in His Son, Immanuel. 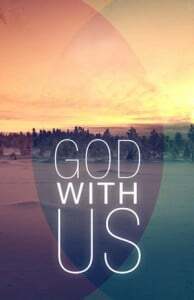 Genesis 28:15 NIV “I am with you and will watch over you wherever you go…” God was with Israel: beside, before, behind. Yet Israel was not WITH God.